Our consultants’ partner with organizations to offer ongoing services related to developing People CMM®-compliant processes, piloting the same and monitoring their implementation to ensure alignment with organizational objectives. Our suite of People CMM consulting includes sharing best practices, mentoring, conducting spot-checks and training. People CMM® is characterized by a holistic approach to people-related issues. 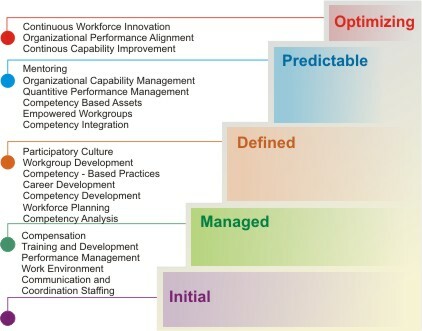 Instead of looking at traditional Human Resource interventions in a reactionary piecemeal fashion, the People CMM® framework enables organizations to incrementally focus on key process areas and lay foundations for improvement in workforce practices. Unlike other HR models, the People CMM® requires that key process areas, improvements, interventions, policies and procedures to be institutionalized across the organization, irrespective of function or level. Therefore, all improvements permeate throughout the organization, thereby People CMM ensuring consistency of focus with an emphasis on a participatory culture, embodied in a team-based environment, where individual innovation and creativity are encouraged.